The last day of our holiday was a Saturday. We had to be ready in the hotel foyer at 1220 for the arrival of the coach that would take us to Cancun Airport. That gave us most of the morning for packing our bags, collecting a plate from the potter, and having one last look at what had been our palatial home for the past fortnight. We would miss the waiters, our chambermaid, friendly staff who maintained the gardens, the cleaners, the food and the smiling faces of people whom we had met. 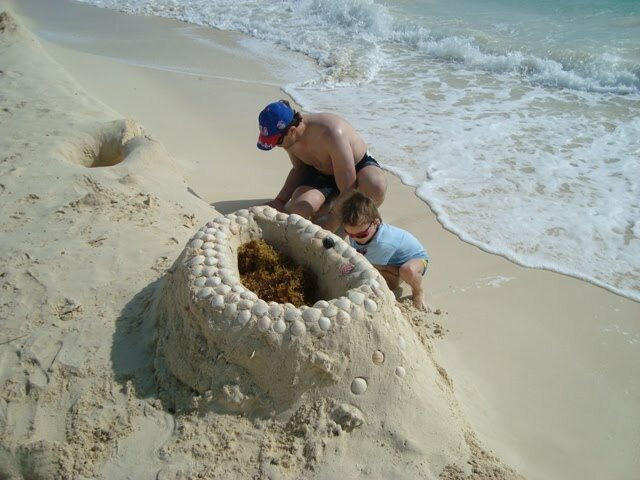 We would miss the sand, the sea and the beach. 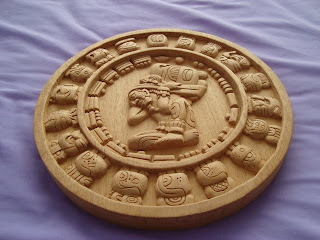 Memories of these things would linger on, and mementos would remind us of our visits to Cozumel, Cancun, Xcaret Eco Park and the Mayan pyramids at Coba. Photographs and videos would allow us to have a closer look at things and happenings that at the time had been all-absorbing, so that we missed much of the detail. The passing of time would impart a perspective to the holiday which we think was the best ever since were married in 1960, just over 50 years ago. It’s been the crème de la crème. Sure as his word, the local potter produced the plate which we bought as a gift for our daughter-in-law. How he managed to fire it, and cool it down without it crazing, I shall never know. I will not bore you with details of our return journey from Cancun to Gatwick Airport and from there to our home in constant heavy rain which undoubtedly contributed to a record number of accidents on the M25 that Sunday morning. Our driver avoided them all and safely returned us to base camp. This was our last full day at the resort. The weather was almost back to being perfect, both sunny and calm. We spent the whole morning together on the beach, and while there, in between sunning ourselves, we had a pleasant walk lasting an hour and a half. There were a good many things to look at including parasailing, jet skiing, people swimming and children building sandcastles. Right beside the steps leading from the hotel pool to the beach there was a display of Mexican ceramics for sale. This caught the eye of my wife and one particular plate appealed to her, but it was damaged. The potter who made it said he would do another by 10.00 am the following day which was the day of our departure for home. 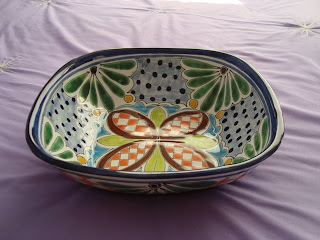 This seemed impossible to me, because of the time needed for decorating and firing it. Undeterred by my reservations, my wife went ahead and agreed a price. After lunch we walked to Playa del Carmen for another look at the shops. Certain items were found for folk back home. On the way to the hotel, out of nowhere a cloud appeared and we were drenched before we could make it to the door. Going through the foyer we looked like drowned rats, but it was fun, especially observing the looks people were giving us. We left trails of water across the polished floor and up the stairs to the second floor on the way to our apartment. Clouds thickened and rain continued pouring down, but our holiday was nearly over and we were thankful that mostly the weather had been kind to us. That last evening we looked forward to meeting one particular waiter by the name of Samuel who had taken a special interest in us. He had a remarkable smile that made many people happy. Whenever he engaged with them he would smile, and inevitably they would smile back. Work for him, although hard, was always pleasurable. He served a sweet white wine for the start of our meal and placed table napkins on our laps. Each evening there was a different theme based on foods from countries around the world. On offer there were a variety of Chinese dishes, plus the usual Mexican foods, salads, fruit, cakes and ice cream. There was more rain, so we went to our apartment and watched TV. All in all, it had been a good day. With only two more full days, inclusive of our 13th, we realized our holiday was coming to an end. There was a need to prioritize what ought to be done before our departure. My wife wanted to find one or two mementos she could take back home. From an email we had received we learned of a relative who was seriously ill in hospital. Obtaining up-to-date facts about the situation was not easy, because our phone card was not working, and making contact by using Skype was proving illusive. Linking up across time zones was also problematical. Emails were the best means of communication, but they were not always replied to until hours later, sometime days. The weather was still unsettled, so that it was not exactly perfect for sunbathing and being on the beach. A few hardy souls were out on their loungers, in the hope that the sun would break through the clouds. We were philosophical about the situation because the cooler conditions were better for us, as we intended visiting local shops. Despite a thorough search of Playacar, which took most of the morning, my wife could not find what she wanted. We returned to our hotel for lunch. Afterwards we sat beside the swimming pool where we were protected from the wind, and by then the sun was more in evidence. Mid afternoon was an ideal time for Skyping with folk back at home; therefore I set up my miniature laptop in the foyer of the hotel. Unfortunately, no one was available at the other end, and there were no new emails with information about the patient in hospital. Because I wanted a visual record of the architectural features of the hotel and reminders of the hotel’s interior, I took the opportunity for taking more photos than I had already acquired. Then I rejoined my wife at the pool, by which time there was only a scattering of clouds and the temperature was pleasantly warm. Drinks from the pool bar were refreshingly cool. This was a life of ease and luxury to which we were not accustomed. Somehow there was a sense of fruitlessness to such an existence, and I was not at all reluctant about leaving for the UK the day after the next. As I was eating my evening meal in the buffet restaurant I was conscious of the fact that a whole new lot of guests had arrived. They looked bleary-eyed and their skin was a pale white. Most had arrived from snowy Canada where the temperatures were subzero, and a minority came from a colder than usual Europe, mainly from Germany and France, and a few from Britain. We found ourselves sat next to a couple who lived in Berkshire. Like us, their flight had taken ten-and-a-half hours from Gatwick. They were zonked! They said they were determined to keep awake until 10.00 p.m. Mexican time so as to adjust quickly to the new time zone. I felt for them, but soon I would be home trying to adjust to Greenwich Mean Time. We were not inspired to do a great deal on our 12th day. The weather was mainly dull and windy, but it did brighten up a little about mid-afternoon. In the morning we walked to the shops at Playacar and bought tee-shirts for our grandchildren and great grandchildren. My wife also bought a few small shells for one of our daughters - at her request to decorate her bathroom. After lunch we tried using a phone card for making calls to the UK, but we could only raise engaged tones. A dog? A cat? Definitely an animal! As usual in the evening, there was a wide choice of foods at the buffet restaurant, and the presentation was first-class. I particularly liked the butter sculptures - that’s what I think they were. These pieces were at their longest dimension about a foot long, wide or tall. They were carved and modelled in a medium that may have been a form of butter, lard or cooking fat. We took a post-prandial walk to a good quality silver jewellers which was approximately a mile-and-a-half from our hotel. My wife found some pieces that interested her and she did a deal for a pair of earrings to give to one of our daughters. There was never a problem with walking the streets at night in the vicinity of the hotels. On the news at home, we had heard of murders, muggings and problems with drugs in Mexico - even gun battles between the police and gangs, but wherever we went we saw nothing of the sort. We felt completely at ease. At some shops with expensive items for sale there were uniformed security guards, and in places where there were crowds of tourists we always saw at least one armed policeman. Having a high profile security presence must be a deterrent to would-be criminals. The day for our second organised visit by a tour operator had arrived, but the sky was overcast, and as we were having breakfast, down came the rain. Nevertheless we joined others in the coach that was taking us to Coba where we were to visit a Mayan village and climb the tallest stepped pyramid in Mexico. Because we were in a coach set aside for a French speaking guide, we were transferred to one where the guide spoke English; his name was Ricardo. We discovered that there were two other people from England and mainly Canadians and Americans onboard. By the time we arrived at the venue it was still raining; therefore Ricardo suggested we may like to buy plastic capes from one of the trinket shops. Most of us did; then we set off on foot along a rough track through the rain forest to the first of the pyramid temples. En route we were given a demonstration of how sap was taken from a gum tree for making chewing gum. A man climbed the tree by using a length of rope looped around its trunk. He gripped the bark with his bare feet and at the same time flicked the rope up or down to make progress upwards or downwards as he wished. When near a point where the first branches spread apart he mimicked cutting into the bark with a machete for making a channel through which sap would flow to the base of the tree where it would be caught in a curved bowl. The solidified mass of the sap would be broken into small pieces and chewed. That was the earliest form of chewing gum. On our arrival at the first of the stone temple pyramids, Ricardo did his best to describe how it was used by the ancient Mayans. The lecture over, rain continued to fall, and we walked along a rough track that led to a shack where we were to have a buffet lunch. The meal was adequate, but not attractive, and I was a little dubious about the hygiene aspects of its preparation. In retrospect, neither of us suffered with a tummy bug as a result of eating the food. The next part of our ‘adventure’ was a walk of about a mile-and-a-half along a slightly better track than the one we had previously traversed. Those who would prefer to be taken on rickshaw-type tricycles could hire them, and boys to do the peddling. We chose this option. Each tricycle had a bench seat facing forwards and a large umbrella which kept the rain off. Our boy followed those who were on foot, but at one point the pathway diverged and the walkers took a shorter, but rougher route. We who were on tricycles arrived at the foot of the Coba pyramid before the walkers and when they joined us, Ricardo continued his discourse about how the Mayans lived. We were then invited to climb the pyramid. There were no provisions for safety, save for a single rope stretching from top to bottom that was fed between loops of iron embedded in the large rocky steps. Altogether there were 120 of them. In my imagination, people looked like an army of ants climbing up and down a huge mound. I followed my wife closely so that if she were to slip, I might have a chance of halting her fall. About half way up she paused to get her breath; then we continued until we reached the summit which consisted of a rough stone, unfenced platform. There a Canadian who was a bit younger than me congratulated us on making it to the top. He offered to take a photo of the two of us, which we gladly accepted. It was like being on top of Everest. The only thing missing was the Union Jack! 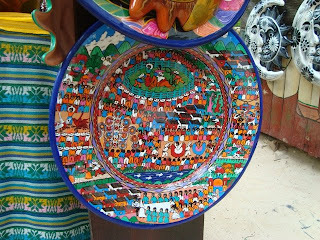 After arriving back at the coach we set off for a Mayan village of which Ricardo was full of praise. He extolled the self-sufficiency of the villagers who produced all they needed for their existence. The men worked the land, bred pigs and poultry, and they harvested fruit and nuts from trees. Other plants were used for medicinal purposes. The women kept home and did things like weaving fabrics, making hammocks, preparing and cooking foods and looking after the children, all of whom attended school on a shift system. My view of the villagers’ existence was not as rosy as Ricardo’s. I saw poverty and deprivation - a people with not much hope of improving their existence, and I felt a little uneasy in that they were being exploited by tour operators. If they were being given appropriate payment for their services I believe their living conditions would have been better. We were exhorted by Ricardo not to give any money to the children or the adults for that matter. Reality - this is home! The final part of our outing was a visit to a pool that was supplied with water by an underground river. Those who wished, could have a swim in it. Only a handful did. Back at the hotel we were in absolute luxury by comparison with the Mayans in their slums. I call them ‘slums’, for that is what they are. Our visit put things in perspective and made us realise how very fortunate we are, and the experience gave us a sadness regarding the lot of those poor Mexicans. It had been a very long day that was only marginally marred by rain which eased off in the afternoon and disappeared altogether before evening. I was glad I had seen the pyramid temples and that I had been able to share the experience with my wife. She said the best part of the trip was when she found herself standing on top of the big pyramid - she also enjoyed the tricycle ride. In contrast to our visit to Cancun the day before, we had a day of little activity by the poolside and on the beach. My wife was into shell hunting; searching where fresh shells were being washed up on the beach between the low and high-water marks. Many of the older shells buried in the sand had become coated with deposits of limestone that had adhered to their surfaces, inside and out, causing them to have weird shapes. By searching diligently, new shells could be found with shiny surfaces, because they had not been affected by the limestone of which the whole of the Yucatan Peninsula is made. I took a short break during the afternoon for Skyping relatives back home and for taking photos of features within the hotel that interested me. It‘s not appropriate for me to display the features photographs here at the moment, but I have uploaded some of fruit carvings and one of an ice sculpture I noticed in the restaurant that evening. New decorative fruit carvings and ice sculptures were placed on display every day to enhance the presentation of mouth-watering foods. 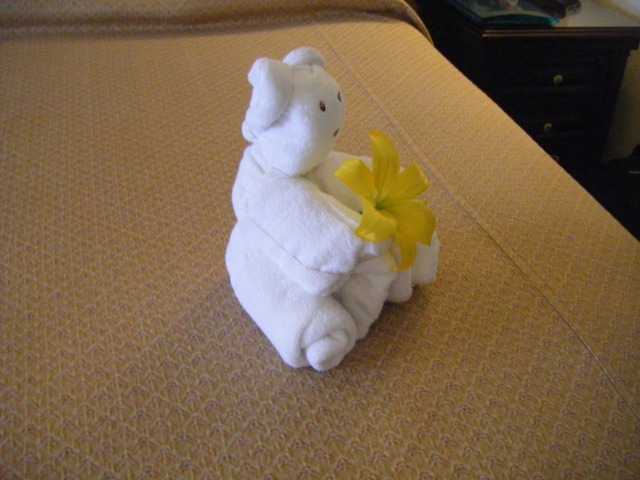 When we arrived back at our apartment after our evening meal, we were surprised that the chambermaid had decorated our bed with a yellow flower and two tiny silver paper weights, each with the word ‘kisses‘ on them. Such touches added to our enjoyment and the total experience. We wanted our holiday to be a bit more than just a time on the beach, therefore we planned to join one or two organized tours and to do a couple of our own. 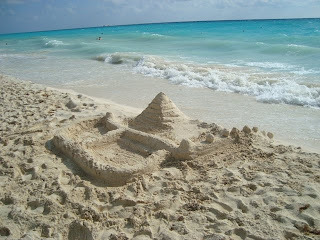 Monday had been set aside for a do-it-yourself visit to Cancun. 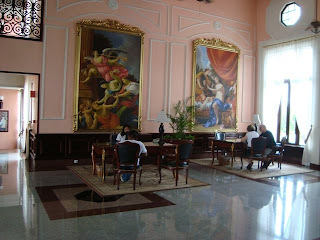 We had already travelled from the city’s airport to our hotel by transfer coach, so we knew what to expect. 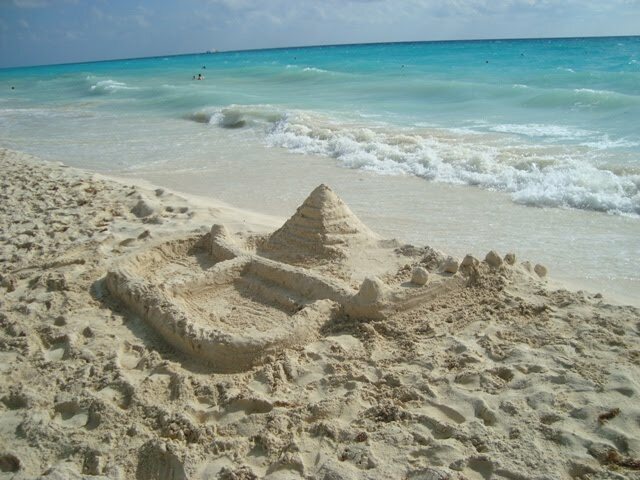 It would be an hour’s journey from Playa del Carmen. The weather was fine, sunny and hot, but the air conditioning in the coach chilled us. My wife wrapped herself in her sweater to keep warm. We were amazed at the large number of advertisement hoardings along the route and I observed hundreds of lattice aerials for transmitting TV and mobile phone signals. There were numerous electricity pylons and very ugly concrete structures supporting cables, transformers etc.. All of this paraphernalia, plus many functional factory type buildings, did nothing to beautify the rather flat terrain. Efforts had been made to improve the visual aspect along stretches of recently constructed sections of the highway by planting colourful shrubs and trees on central reservations. Cancun bus station is sited right in the middle of a rather rundown part of the City. From there we walked to a market place that had been recommended to us by our Thomson rep for obtaining traditional Mexican craft articles. We found the place quite easily. It was similar to what we had seen on the island of Cozumel and the trades people harassed us to buy their wares in the same way. My wife found a good quality terracotta bowl that was not too gaudy for her taste. She bargained with the shopkeeper and got it for a reasonable price. Our rep told us to always haggle when buying, because one could probably reduce the asking price to one third of the original. Haggling is not the norm in England, therefore doing it was a bit strange. After checking out the craft market we took a taxi to Liverpool, which is an upmarket mall with very expensive shops, situated on a strand enclosing a lake beside the sea. There are at least four marinas within the lake with access to the sea via an opening at the southern end. We bought our lunch at Starbucks and ate it while sitting on a bench with a view overlooking the lake. Even there, we were asked by a fellow if we would like to rent a luxury motor yacht on the lake. Before and after lunch we looked at the shops to see what they had on offer. Because Liverpool is situated in an area where there are top-notch hotels for the very rich, the local shops had appropriate goods for sale, items far beyond our means. You name it , they had it - designer jewellery, clothing, household items, novelty trinkets etc. 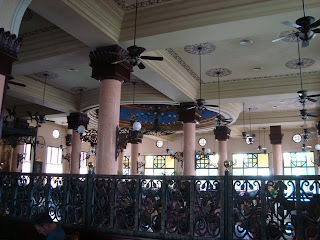 By mid afternoon we had had enough and returned to the bus station by taxi. We arrived back at our hotel in good time for the evening meal which was in the Brazilian restaurant. 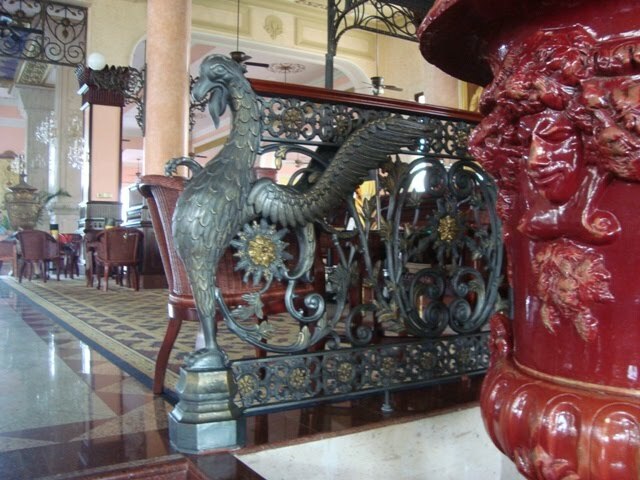 The buffet selection was supplemented with several meat offerings that waiters carved from spits. After sampling most of the latter we had no room for more and left the restaurant to flake out in our apartment. It had been a good day. It was a Sunday. We decided to have a relaxing time mainly on the beach. Had I been home I would have joined with other Christians in worshipping Jesus at my local church. I can only remember seeing one church building at Playacar, most probably where Catholics attend mass and other services. From things I saw in that part of Mexico it would appear that the cross is a popular symbol associated with Jesus and in particular it seems to be used as a symbolic motif for protection from physical harm. Many taxi drivers hang crosses behind the windscreen of their cars. I saw one man who had a cross tattooed on his back. The local lifeguard overseeing safety at the beach had a red cross printed on his tee-shirt and his VHF set had two crosses emblazoned on it. His jet ski boat also had a red cross on it. At Playacar there were porcelain crosses on the side of a house, and in several of the trinket stores there were brightly decorated ceramic and plastic crosses. I was a little restless and I needed to burn off energy; therefore I did a considerable amount of walking along the beach. There was a force 4 onshore wind which caused the waves to break onto the sand. I enjoyed watching the aquatic activities, including swimming which was not banned by the lifeguards. 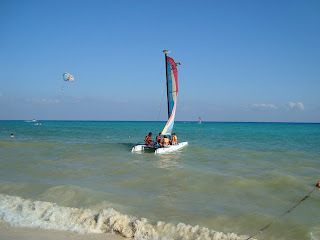 Several parasailing boats were out on the water, because the conditions were ideal for them. They could manoeuvre their parachutes so that they hovered over the beach, which must have been thrilling for their riders. 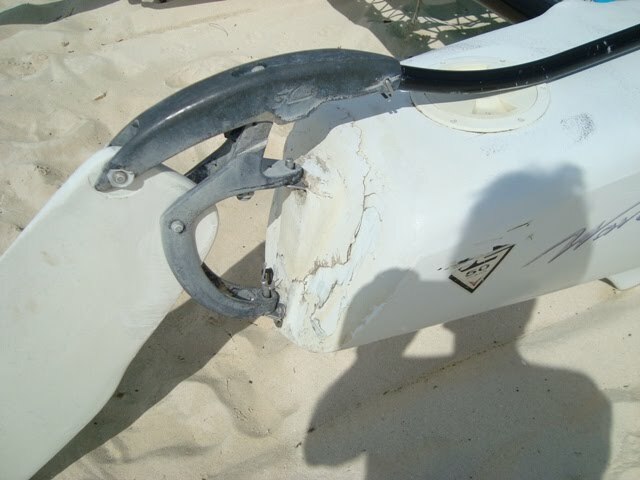 The operators of scuba dive boats anchored just beyond the breakers had to take great care not to misjudge things when loading and offloading crew and equipment. Had an anchor dragged, and an engine failed, their boat would have been stranded on the sand. Windburn was added to the effect of sunshine on my body, and at last, the factor 30 sun cream was marginally penetrated so that a light tan was imparted to my skin. I really felt that I was on holiday and that I was benefiting from vitamin D derived from sunlight. When I returned to our apartment at the hotel I noticed there was a large blister on the inside of the little toe of my left foot. This I treated with one of those special plasters that resemble skin and which act as a temporary covering for preventing further abrasion and infection. That evening we used Skype on my miniature laptop to keep up to date with news at home. Reception at the hotel via the free WIFI was just adequate for seeing blurred images on the computer screen. This was the day we set aside for taking the ferry from Playacar to the island of Cozumel. The weather was hot and almost windless - ideal for the crossings which lasted 45 minutes each way. The most convenient method of getting to the ferry was by walking along the beach from our hotel. 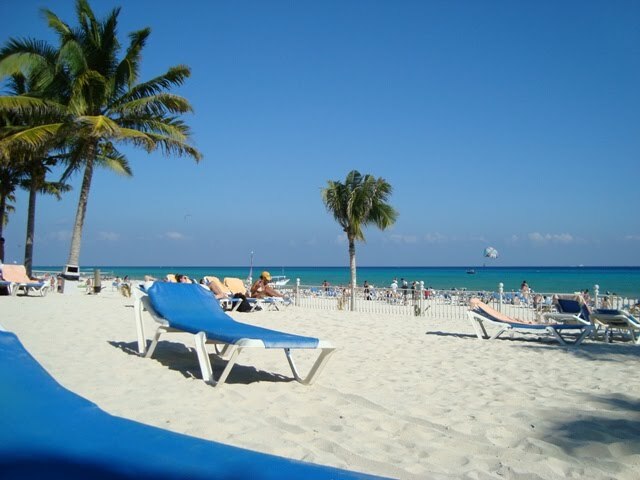 The economies of places like Playacar and Cozumel are highly dependent on revenue from tourism; therefore most things are geared to encouraging visitors to part with their money. Passengers on the ferry were no exception. They were a captive audience that could be subjected to visual and audio input via a large video screen and amplification system advertising hotels, restaurants, scuba diving, luxury catamaran sailing, jet skiing, parasailing, car and scooter hire etc. We wanted none of these things. From the moment we stepped off the boat we were invited to enter almost every shop we passed, to buy wares, articles of clothing, trinkets, jewellery, craft items, food, shells and many other pieces of tat. Being hassled in this way was not a pleasant experience. We found a short respite when we sat down in a McDonalds for chips and Coke. From the veranda we overlooked a jetty where there were two glass bottom boats used for viewing coral reefs, of which there were several bordering the south-western side of the Island. My wife has a small collection of shells, and she was on the lookout for another shell to add to her assortment. We found two stalls where they were being sold, and one of them looked promising, but the price asked for the shell my wife fancied was outrageously high. No amount of bargaining brought about a sale; however, bartering at the other stall resulted in a good deal being done on a shell that was nearly as attractive as the one she had wanted. Walking around the market places in the hot sun took its toll, and we were pleased when we found a Starbucks café where we had coffee and a light snack, before heading back to the ferry terminal. On the return passage our boredom was relieved by a conversation with an American lady from North Carolina who was passionate about scuba diving. Normally she dived with her husband, but for the very first time she was taking a break away without him. She had a very demanding job that required much travelling around the world, and she desperately needed a complete rest to unwind and rebuild her strength. Consequently, she had decided to stay with a lady friend who lived on the mainland. We told her of our disappointment with Cozumel and she said that she had been there on numerous occasions for diving. 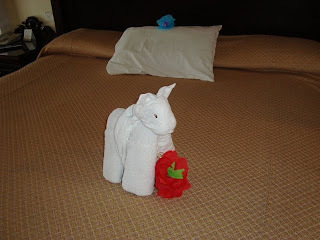 If we knew where to stay, and the better parts of the Island, she insisted we would like it. Back at our hotel, we cast aside our disappointment with how the day had panned out, and we enjoyed a sumptuous feast at the buffet restaurant. This was the day set aside for our visit to Xcaret Eco Park and swimming with dolphins. Everything would be provided, including towels. The weather was sunny and hot. We were excited about our forthcoming encounter with dolphins, but to our surprise only one place had been booked, due to a misunderstanding by the Thomson rep. He had assumed that my wife would not want to go in the water, as she mentioned she was a non-swimmer, which is not exactly true. She can swim, but she is not a strong swimmer. We had discussed the option of her going in the water for contact with the dolphins without participating in the swimming, and there was provision for it to take place. However, when we presented our ticket, we were told that only one person had been paid for to go in the water and that the event was fully booked. Before my wife went in the water, there was a prep talk about what was planned to take place and how one should inter-react with the dolphins. There were a certain number of tricks they could perform, the most spectacular being to propel a swimmer over the surface of the water. The swimmer faces down on the water with his hands and legs splayed out, and two dolphins place their snouts on respective soles of the swimmer’s feet, then the dolphins accelerate so that the swimmer planes over the surface of the water. Other tricks they do include swimming around a group of people standing in shallow water, slapping their tails on the surface of the water, leaping out of the water and passing over a row of people standing in it. They also kiss the cheeks of willing participants. My wife enjoyed being kissed. The taking of photos by spectators was not forbidden, but unless one had a camera with a telescopic lens, obtaining close-ups was impossible. My photos and videos of the event do not do it justice. We could have bought photos taken by professionals at the dolphinarium but they were excessively expensive. We could also have purchased a CD with videos and photos; however, the cost did not warrant doing so. We were a little disappointed with Xcerat Eco Park because several of the animals did not look happy. The jaguars displayed signs of stress by repeatedly walking to the edge of the moat that penned them in, and the manatees were almost motionless trapped in the confines of a shallow water basin. There were only a handful of monkeys that we could glimpse between the foliage. Other animals were kept in small enclosures, except large lizards which appeared in places throughout the Park. They looked to be in good shape. Sadly we saw few butterflies in their netted enclosure. There was a lot more to the total experience of the Park, including a buffet lunch, a horse show at which riders demonstrated their skills by doing things like handling a lasso, placing picks into stuffed bags mounted on a mobile three wheel barrow fitted with horns to represent a bull at a bull ring, and making their steeds perform actions such as rearing, rotating on the spot and trotting diagonally. The biggest attraction was an evening theatrical presentation involving hundreds of actors who took part in a number of scenes representing the history of Mexican civilization. It was a spectacular colourful show, spoiled to an extent by the excessive volume of accompanying dramatic music and dialogue in Mexican which I could not understand. We liked the craft areas where artists and craftsmen displayed their wares for sale. Their wood carvings were exceptional, being far better than most of the usual junk produced for tourists. It was a long day, but we arrived back at our hotel via a taxi in time for a late dinner. When you are spending time on the beach, the weather is all important. We noted that the wind was stronger than on previous days and there were quite a few clouds about. Instead of coming from the northwest the wind was from the east, directly onshore. This made it tricky for those sailing the Hobie Wave catamarans because they had to overcome the surf and the swell while beating offshore. Conditions were also tricky for those managing dive boats. To get their gear and divers onboard they needed to anchor their boats close to the beach, where the waves were steeper and often breaking. I noted that their fisherman type anchors were directly attached to warps, with no chain. Presumably this was to make it easier for deploying and retrieving the anchors. We had a pretty relaxing day sunbathing and watching the activities which included parasailing and jet skiing. The yellow flag indicated it was safe for swimming, and a number of people tried a bit of surfing with boards. 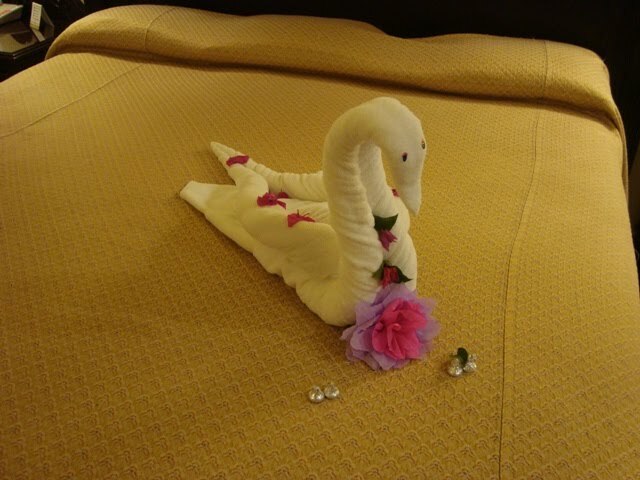 When you are staying at a hotel for a fortnight, one day is very much like another, and you can lose account of time. Therefore at the beginning of our holiday I made a calendar so that I could mark in planned events. We had in mind a day visit to Xcaret Eco Park, first to swim with dolphins, then to see jaguars, monkeys, stingrays, manatees and butterflies, plus craft products, including ceramics and woodcarvings. There would be two shows to watch: a horse show and a spectacular theatrical production in an enormous indoor arena with hundreds of actors portraying a potted history of Mexico. We also wanted to spend a day at Coban to see a traditional Mayan Village and to climb the highest stepped pyramid temple in Mexico. 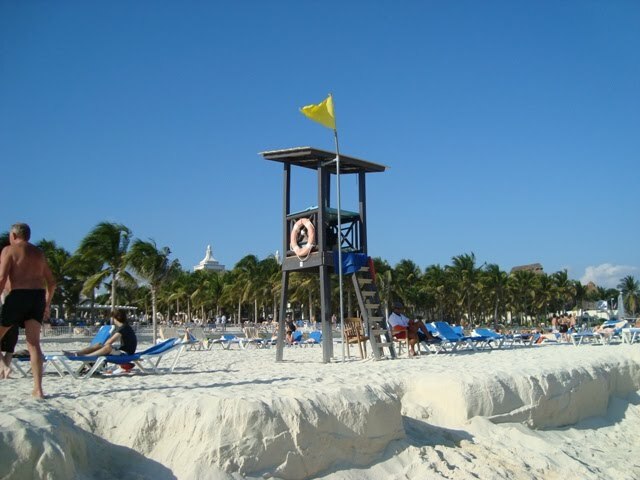 We would arrange our own passage on a ferry to the island of Cozumel and go by local coach the forty miles to Cancun. All of these outings I recorded on my makeshift calendar, along with bookings to dine at various restaurants within the hotel complex. On our fourth day, which was a Tuesday, we booked and paid for our planned excursions, then retired to the beach for a swim in the sea and to sunbathe. We also explored the beach as far as we could walk in an hour. There were several scuba boats being refuelled while anchoring off the beach. Usually the diesel was taken in large plastic containers by jet bike from the beach. Divers dressed in their black neoprene outfits waded to their boat and carried their oxygen cylinders at the same time. If the sea was too rough for the boats to anchor close to the beach, jet bikes were used to ferry scuba divers and their equipment to and fro between their boats and the beach. That evening we dined at the Agave Restaurant for sampling a gourmet meal of Mexican fare. After eating our meal we strolled along the road leading to several hotels. We also looked at local shops and found a good quality silver jewellery store where my wife bought a pair of chunky earrings for one our daughters. I was a little frustrated because my miniature laptop had a glitch. It was wrongly configured so that there was a conflict of Internet Suppliers’ addresses which meant that the only way I could gain access to the World Wide Web was by paying for the use of a computer at a the hotel’s Internet café, which happened to be one of the bars. Only later did I manage to sort out the problem by changing the settings of my laptop. By then it was too late for uploading a daily Blog recounting our experiences. I resigned myself to writing an account of our holiday on my arrival home. Hence, you are reading this. We discovered that the hotel had five thematic restaurants in addition to the buffet restaurant that was open most of the time. It too, laid on meals each day with differently prepared meals, based on cuisines from Japan, Brazil, China etc., plus the usual Western dishes with a wide variety of cooked foods, salads and sweets. Eating and drinking in moderation would be the problem, since all meals and drinks were inclusive. As there were many tempting foods we would not normally eat, we had to exercise a modicum of self-control. 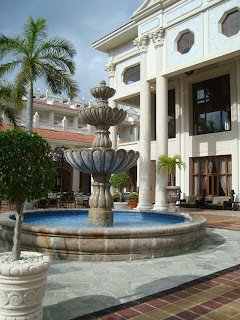 In addition to the restaurants there were several bars, one of which was between the main swimming pool and the beach. There, all kinds of cool drinks were dispensed, and a beach service was also provided. Most entertainment during the day took place beside the pool, including an early morning invitation to join in gentle aerobics to which few responded, the majority of visitors preferring to sunbathe on the terrace. 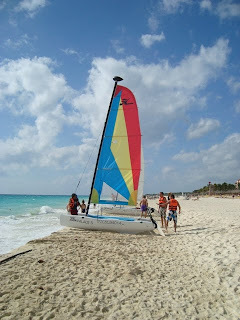 On the third day of our visit I thoroughly checked out the Hobie Wave catamarans and I was not in the least surprised to find that two of the half dozen belonging to our hotel had deficiencies. Each of them had lose screws used for attaching rudder fittings to their hulls and one had a snapped chainplate on one half of the double plate, which meant the mast was being supported with a chainplate that could fail when placed under load. When I pointed out the deficiencies, those in charge of the boats produced a screwdriver and made the screws tight, but nothing was done about the chainplate. I resolved there and then that I would not sail on any of the Hobie catamarans. A further inspection of other Hobie Wave catamarans based at hotels along that beach revealed even worse shortcomings. I noticed one that was being drained because substantial amounts of water had entered both hulls, presumably because of seepage between the rudder fittings. Two of them when being sailed were low on their marks, not just because of the weight of the crew, but because they were compromised by water within their hulls. It would appear that these boats had been handled by sailors who did not know how to manage them properly, especially when being launched off a beach. Often rudders would have been subjected to horrendous stresses when the catamarans were thrown sideways by breakers while their rudders were in contact with the beach. Googling on the Internet reveals little about the shortcomings I have discovered and documented by photographing and videoing Hobie Wave catamarans that have frequently been launched off the beach south of Playacar. On the contrary, everything would indicate that owners are very satisfied with their boats, and not doubt the majority are. I would conclude that the conditions of frequent use off the beach by people unskilled in handling these catamarans is the main reason for the breakages, but for peace of mind, if I owned a Hobie Wave catamaran I would strengthen the attachments for the rudder fixtures. My wife and I seldom spend much on self-indulgence, but after fifty years of marriage we felt we could celebrate by having time together entirely to ourselves. We could relax in a pleasant environment without having to worry about other people and attend to their needs. Our children, their children, our great grandchildren, friends and acquaintances would manage for a fortnight without us being around, and such was the case. They survived in our absence. The adage that comes to mind is that no one is indispensable, but we were pleased on our arrival home to be told that we had been missed. 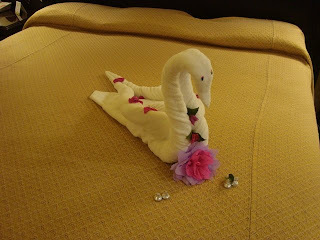 Our holiday had indeed been a relaxing experience, and for this we owed much to the personnel of the hotel for their genuine interest in us as individuals. Waiters in particular took great care to please and to serve with real concern for our wellbeing. They were not in it for tips; they really wanted to have a relationship based on service, and several of them were keen to learn about the UK. Some opened up by telling of their own circumstances, where they lived and how they became waiters. Even the valeting staff had that personal touch. 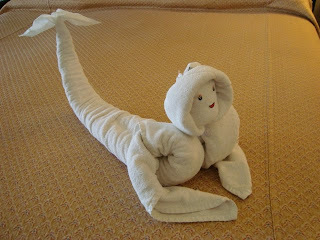 Each morning our bed would be made up, and there would be displayed on it an example of towel art. 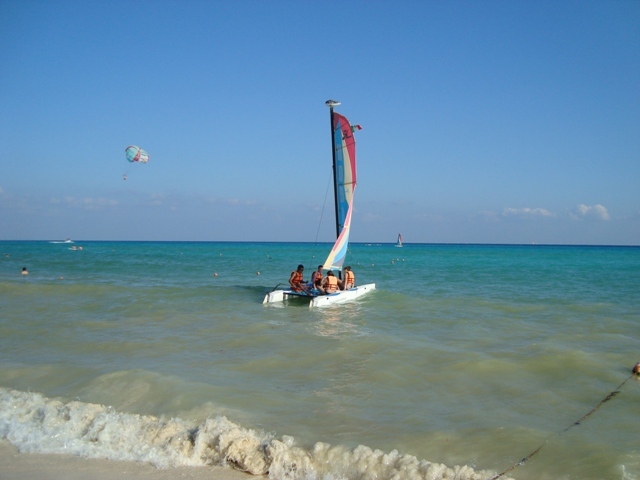 On our second day, I thoroughly checked out the aquatic activities consisting of sailing catamarans, paddling sit-on-top kayaks, sail boarding, snorkelling, scuba diving, jet skiing and parasailing. The surprising thing was that I didn’t feel like doing any of them. To use an Americanism, I wanted nothing more than to ‘chill out’. That is what I resolved to do and what I did. It was not a time to be lazy, just lying on a sun lounger all day. I was into getting exercise by walking and exploring the neighbourhood on foot. Together, my wife and I went on three day trips, two of them organised by specialist tour operators and one devised by us – more about them later. 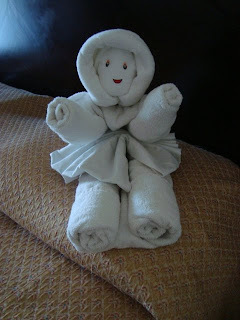 Meanwhile, I’ll leave you with photos of some of the towel art that had been placed on our bed, morning by morning.